Electro-Acupuncture (EA)a form of acupuncture where a small electric current is passed between pairs of acupuncture needles. EA uses the same points as acupuncture, and operates on a similar principle. 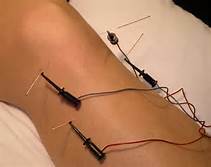 EA use in conjunction with acupuncture needles is an alternate way to stimulate the point and enhance the qi. This technique is very safe for most people; however, it is not recommended for patients with a pace maker or a history of seizures or epilepsy.